Coconut Oil has been used for centuries as a vital source of food for health and general well being in tropical regions. 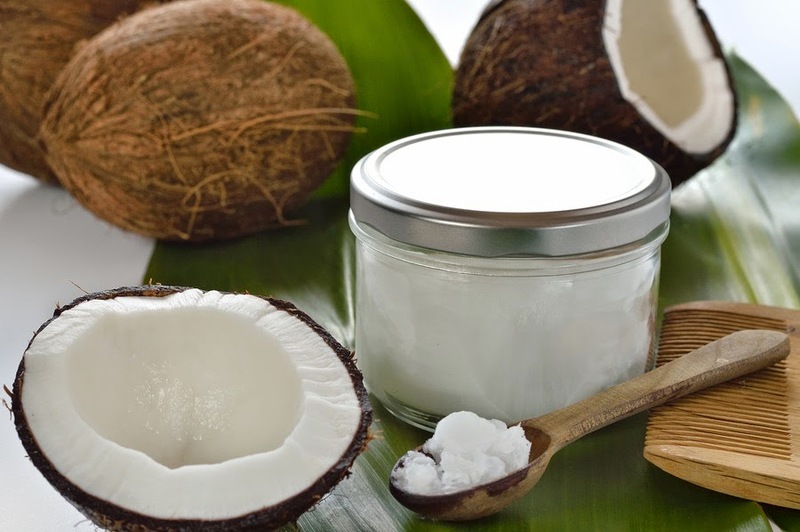 Recent research verifies traditional beliefs that the coconut palm is “The Tree of Life” and that, just like any other pure, whole food, coconuts and virgin coconut oil have a significant role to play in a well balanced, nutritious diet. It's very versatile and one of the healthiest oils in the world and can be used in cooking and topically for your face, body and hair. These benefits of coconut oil can be attributed to the presence of lauric acid, capric acid and caprylic acid, and its properties which are antimicrobial, antioxidant, anti-fungal, antibacterial, and soothing. Coconut oil is one of my favorite natural beauty and health oils! Check out these awesome DIY Coconut oil recipes I found on the Organic Authority. Sugar Scrub: One of the simplest DIY coconut oil products to start with is a sugar scrub. Simply combine coconut oil and sugar to use as an exfoliating scrub. I use it prior to shaving to make my skin smoother and easier to shave without toxic shave gels. Salt Scrub: Substitute coconut oil in this recipe to make a great scrub for exfoliating your skin. Lotion Bars: These bars made with coconut oil, beeswax, shea butter and almond oil are amazing for rough, dry skin. I love to use these on cracked heels. Eczema Cream: This eczema cream made with coconut oil, shea butter, Melrose and lavender essential oils works wonders on eczema. Lip Balm: Soothe your chapped lips with coconut oil and lavender. Toothpaste: Coconut oil is a great ingredient for toothpastes because of its antibacterial and antimicrobial properties. It has been proven to prevent tooth decay. Considering that triclosan and other synthetic toxic chemicals are used in store-bought toothpastes, making your own is a great choice. Deodorant: Try this deodorant with coconut oil and bentonite clay. Sunscreen: Make your own non-toxic sunscreen with coconut oil. Shaving Cream: Coconut oil, baking soda, honey and castile soap make up this homemade shaving soap bar. Oil Cleansing Method: There are some amazing benefits to cleaning your face with pure coconut oil. This method may work especially well for those with oily skin. Adding coconut oil to your skin rather than harsh soaps can signal to your skin that it’s over producing oil. Hair Treatment: Use coconut oil on your hair and scalp. You can add a little and leave in overnight as a treatment or add some to wet hair right out of the shower. All you need is a tiny dab. Rub in hands until it melts as an oil and run through hair. You can also add a little more and leave in for an hour or overnight as a leave in treatment and shampoo out and rinse as usual. Facial and Body Moisturizer: Coconut oil soothes, moisturizes and hydrates all skin types, it's especially great for dry, flaky skin. It delays wrinkles, and sagging of skin which normally become prominent with age. It helps in treating various skin problems including psoriasis, dermatitis, eczema and other skin infections. You can also use as a makeup remover! Just apply a very small dab as you would a body lotion until absorbed. Weight loss: Coconut Oil is very effective in reducing weight. It contains short and medium-chain fatty acids that help in taking off excessive weight. It increases the body metabolism by removing stress on pancreases, thus burning out more energy and helping to reduce weight. This is why people living in tropical coastal areas who eat coconut oil daily as their primary cooking oil, are so slim and healthy. Aim for 1-3 tablespoons per day. You can add to smoothies, on toast, replace as a healthy cooking oil or eat raw. You can also put it in the fridge and scoop it out cold like I do. Make sure you buy Organic Virgin Coconut oil otherwise you'll loose all the important beneficial nutrients and your money is wasted. You want to also ensure it is cold pressed and USDA organic certified, because that means it has the highest quality organic certification so you can rest assured it's 100% organic, natural and safe. my grandmother used coconut oil for everything and i always thought she was going loco but it looks like she was a real hispter and she was way ahead of the industry lol jk.